It’s been a long time coming, but we’ve finally had the opportunity to tackle a recipe for the D.C. Cinematic Universe! That’s right! Our first DCU recipe is for their newest movie, Wonder Woman. 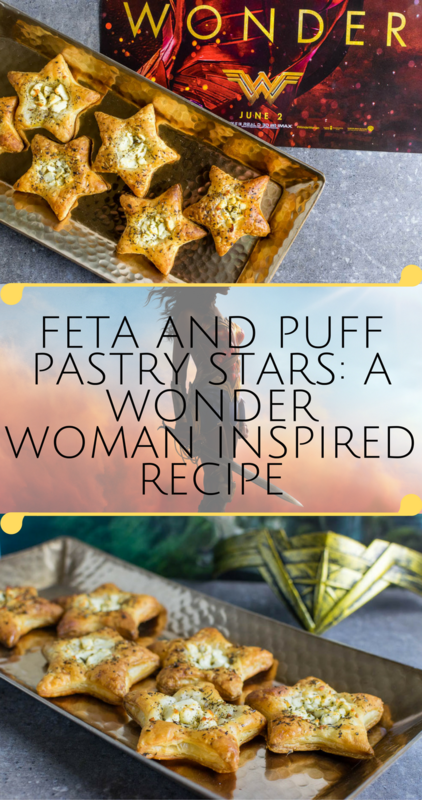 Our Feta and Puff Pastry Stars play tribute to not only Diana’s heritage but also the movie’s. 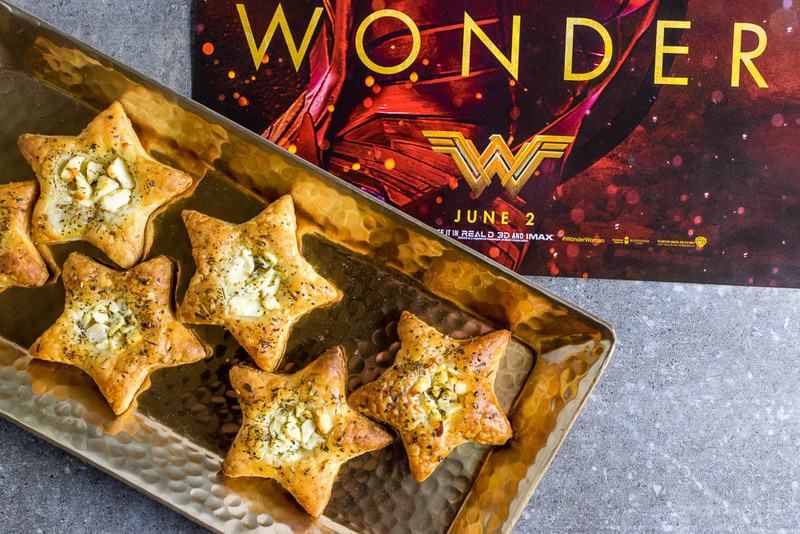 When we created this recipe, we really wanted to honor the history of the Wonder Woman series. We used feta cheese and Greek seasoning to pay tribute to Diana’s heritage and connection to the Olympian Gods. 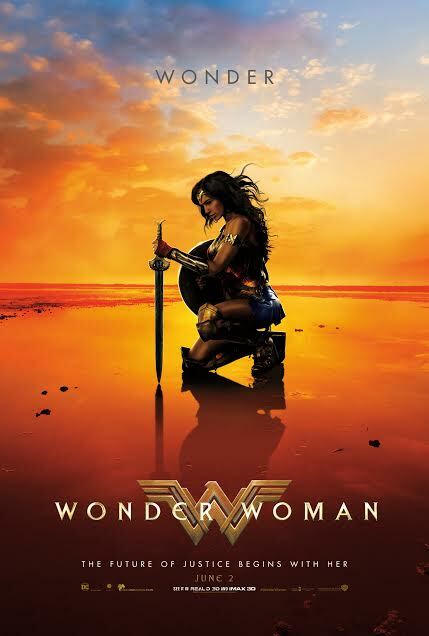 We used the star shape in homage to Wonder Woman’s classic outfit. Our Feta and Puff Pastry stars are easy to make yet look fantastic! They are a perfect way to celebrate Wonder Woman’s first solo big screen appearance. 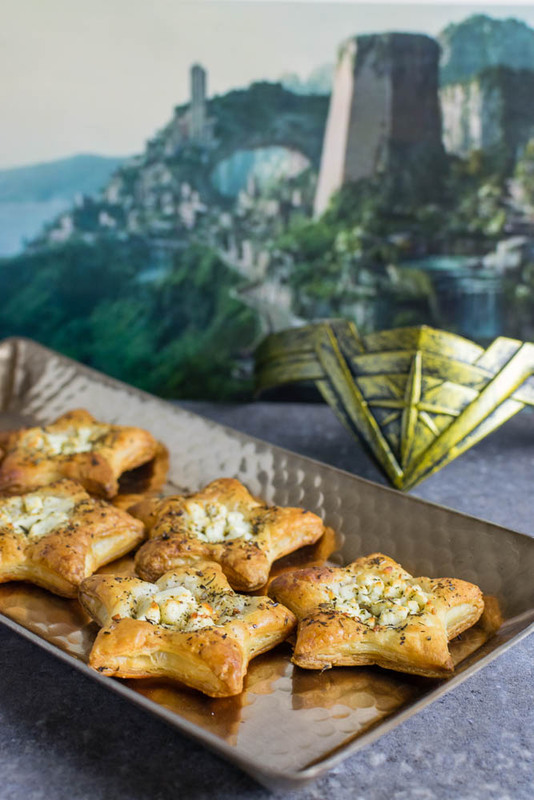 Not only have we created this delicious Feta and Puff Pastry Star recipe, we are giving away 3 pairs of screening tickets for a sneak preview of Wonder Woman. One winner will also receive a Grand Prize Package. The Grand Prize Winner will get a prize pack including a tiara, gauntlet/bracelets, pin, t-shirt, hat, and more. The screening will be on Tuesday, May 30 at 7 pm Harkins Tempe Marketplace. Winners should arrive at 6:30 in order to guarantee their seating. Winners will be selected on Sunday, May 28th. Good luck! Cut out stars from defrosted puff pastry. Place stars on baking sheet. Place 1 tsp of feta cheese and 1/4 tsp of seasoning on each star. These pastry stars look delicious! And soo easy!! Your recipe is so easy to make and life saver when souls are hungry! Oh yummy, these sound great and I love the wonder woman inspo! These puffed pastry stars look amazing! How fun to celebrate a movie with them….Fun Fun Fun!!! That is such a fun idea! Perfect bite for the movie! These looks delicious! I’m such a feta fan, I would put it everywhere if I could. Nice concept with the Wonder Woman by the way! I LOVE playing with puff pastry. LOVE feta too. These are super cute and would make great apps for sure. Only 15 minutes for a wonderful looking recipe? This should definitely happen in my kitchen! Thanks for sharing! How clever to use feta to reference Diana’s greek heritage, I love how you link these cute stars to her backstory, as well as the iconic star design of her costume. They look gorgeous! This looks so YUMMY !!!!!!!!!! Mmmm! These look so good! Wonder Woman was my favorite show as a kid. My mom made me a costume, and I wore it every time I watched the show. I can’t wait to see the movie! I’ll have to smuggle these in when we go. Hahah – I love the inspiration almost as must as I LOVE puff pastry! Those are fun and easy appetizers! Star shape is perfect for a 4th of July party, too. Those look amazing! I’m not a huge comic book movie fan, but I’m actually really excited to check out this movie.